Internally threaded body jewellery made from Titanium and Surgical Steel available from JoBananas. Precision made body piercing jewellery with the thread on the actual attachment or ball that screws into the labret, curved or straight barbell shaft. 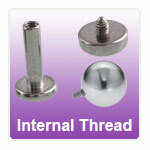 We offer a range of internally threaded jewellery from plain balls, discs, cones and spiked to gem set items and Opals. Check out JoBananas range of high quality fitting internally threaded body piercing jewellery. "was very happy with my two purchases. Bought the scaffold earrings for my Granddaughter for Christmas and know she will love them. I bought the..."